Environmental and hereditary factors contribute to increased risk of developing endometrial cancer. An understanding of risk factors can guide screening modalities in premenopausal and postmenopausal women. 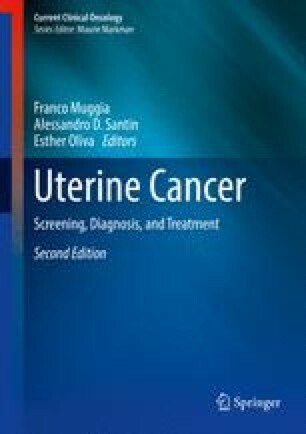 Attention is drawn to certain anatomic abnormalities that prevent vaginal bleeding—the most common symptom related to cancer. Diagnostic tests that are available to pursue various aspects of the diagnosis in a sequential fashion are described, the most important of which is the endometrial biopsy. Recommendations for screening and diagnosis in the asymptomatic as well as the symptomatic patients are summarized. Surgical staging represents the final event in the diagnostic workup. Instances when such staging can be modified to deal with various comorbidities are delineated.